This work is an intensive study of the thematic and stylistic structure of the first book of the greatest epic in the world. 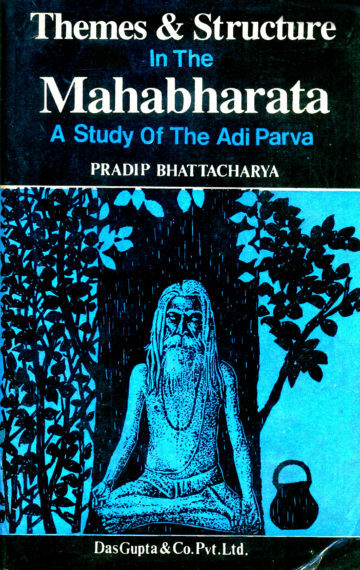 Taking the reader by the hand, it leads him through the bewildering maze of the Adi Parva in such a manner that the brilliance of Vyasa’s story-telling art is not lost sight in the welter of detail. For the first time certain leit motifs have been identified as providing the underlying unity which holds the apparently disparate Adi Parva together. Journey to the Centre of an Epic: “A quality of the treatise that stands out is the manner in which the scholar dishes out information, knitting them together with both relevance and order…If (certain) elements sometimes intrigue an average reader of the epic, Bhattacharya views them in a wider perspective and establishes their justification… While commenting on certain issues Bhattacharya recreates the stories behind them and does so with beauty and restraint, making cogent references to sources to sources outside the Mahabharata whenever appropriate. He shows, through arguments, cross-references to characters and events and drawing our attention to the totality of the Mahabharata are more meaningful than meets the eye. He has followed a method which he expects would let the epic ‘as it were, to grow on the reader’. No doubt he succeeds in this.” Prof. Manoj Das, The Statesman. Far Beyond the Idiot Box: “Pradip Bhattacharya’s illuminating book is a welcome addition to modern work on our national epic…It has obviously been a labour of love–Bhattacharya’s commitment and devotion are apparent in each page of his analysis… (he) deserves all congratulations for providing answers…he has pegged the Mahabharata squarely within an international framework of comparative literature and universal appeal. (His) method is painstaking… He searches for meaning, layer within layer. Thus we find him meticulously splitting hairs with a very definite purpose—the drawing out of nuances and variations of emphasis… Particularly impressive is (his) capacity for underlining the tongue-in-cheek humour in the Mahabharata, which most commentators are too solemn to note…Another service the commentator performs is to highlight those verses which once heard ring for ever in our ears…The book is not for cursory reading. It represents hours of solid study and requires to be approached in a similar spirit. The author deserves all praise for his application in the midst of the pressures of his working life far removed from academic cloisters.” Ketaki Datta, Business Standard. Vyasa Nodding & Critic Napping: “this enthralling book…One does not very often come across a work of such elegance and depth. Bhattacharya’s prose is effortless and beautiful… He has established his firm control over the language even in the poetic form while transcreating some slokas…extremely well-informed commentary…has continuously endeavoured to establish some kind of continuity, remove irrelevance, apparent or otherwise, establish the logicality of seemingly meaningless words and episodes with tremendous research… He presents very interesting social and cultural concepts prevalent within that frame of reference… (he) has made it a point to mention and pinpoint all the Vedic concepts in the epic whenever they occur in the course of narrative…The basic characteristic of the book is the brilliant of incidents which is very clearly the results of extensive research…He has introduced touches of humour too, which, in combination with his erudition and skill with language, has made the book eminently readable…He has also done the stupendous task of connecting far-related incidents…consequently the reader obtains a clear, logical, intelligible and sane picture of the very involved and confused panorama of the Mahabharata…(he) has provided for fun time too…There are so many pieces of interesting information that one is amazed…a genealogical chart and a map…are two of the best points of the book. Thematic analysis and highlighting have made (the book) an experience of a special kind…The book leaves one with a feeling of joy and satisfaction…(he) has analysed the characters and incidents with consummate skill and dedication and provided an unforgettable insight into the greatest story of the tragedy of man. He has done this service only for the first parva. There are seventeen more. Here is hoping that we shall hear from him again, soon, on these.” Maj. Gl. S.K. Sen, VSM, Vyasa’s Mahabharata: Creative Insights, Vol. 1. ed. Padma Sri Prof. P. Lal (Writers Workshop, Calcutta). Vyasan Alap: “A commendable effort to analysis the alap–the baffling nebulous mass of material with which the epic begins…bringing out (the) central theme of each of the subparvas…poetic breath is retained in translation. He also injects a bit of Comparative Mythology…His sub-titling…shows more vividly the connecting links…(they) become a condensed commentary, or rather sutras, to comprehend the Adi Parva…the author (is) a successful explorer of symbolism…He analyses each section and gives his comments. Dhritarashtra’s psychoanalysis from his famous lament is excellent…(His) observations are insights what really help us to get glimpse of the Vyasan Vision and Master’s mastery of his epic art in all its nuances. He helps the reader to to comprehend the web of inter-connections…He also points out similarities with the other epic Ramayana…He gives parallels from European literature of characters, themes, expressions etc. which add a taste of comparative literature and thus widen our field of vision…The study is lit up with humour at places…Vyasa’s humour is also noted. He delightfully follows the Indian habit of chanting out a couplet by way of comment even in a serious critical work. Thanks are due to Bhattacharya for displaying to us some intricate fabrics of the gigantic pattern that is the Mahabharata and giving us another opportunity to breath-in the refreshing air of great poetry, blowing away the monotony of life and opening up a Cosmic Panorama before which all pettiness vanishes.” Dr. Gauri Dharampal, Mother India, The Statesman, Srinvantu. “Most striking…is the effortless way in which he moves back and forth from ancillary material to the Bharata story…it yields gems of insight about thematic congruence that seem to echo throughout the epic narrative.” Dr Barbara Gombach, doctoral dissertation, Columbia University.